Suddenly Dionne Warwick is the Voice of Reason? There’s nothing better then a crazy person going crazy, coming back from crazy, and then having their crazy aunt/cousin try to be not so crazy and issue a statement. Now I’m not sure what I technically just said, but I’m pretty sure I subconsciously signaled for an al qaeda attack. Anyway, good news train wrecks of the faithful, Whitney Houston is going to be back and better than ever! Well, that’s according to her aunt Dionne Warwick. I know I feel better now. 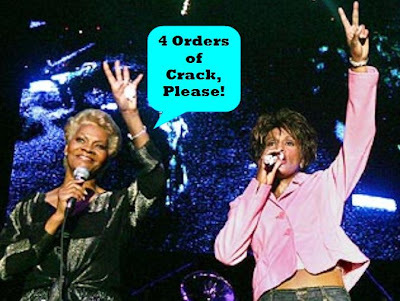 Auntie Dionne was performing some of her biggest hits such as….and uh….oh and then then she sang…er……at Muhammad Ali’s Celebrity Fight Night XIV in Arizona the other night. Celebrity Fight Night? I hope there were Olsen Sluts involved! Thanks Dionne for that pointless thought. I Suddenly Like America Ferrera?